Captain Steven Caulker says Cardiff City's relegation after one Premier League season was down to on-field issues, not off-field controversies. And the 22-year-old England defender vowed to stay at Cardiff after their 3-0 defeat at Newcastle confirmed their drop into the Championship. 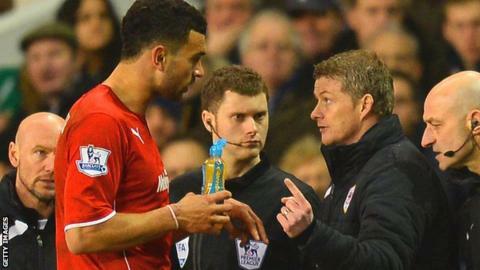 "Yeah, there's been the antics off the pitch," said Caulker. "But we've got to hold our hands up - there's definitely no excuses for the way we've performed in too many games." Cardiff won the Championship in 2013 to claim a place in the top flight after a 51-year absence. But controversies dogged the Bluebirds throughout their Premier League campaign. A contingent of fans continued to protest against owner Vincent Tan's decision to replace the club's traditional blue kit with red in 2012. Head of recruitment Iain Moody was sacked for an alleged overspend of £15m on transfers in the summer - something then-manager Malky Mackay denied. Tan then replaced Moody with little-known 23-year-old Alisher Apsalyamov, who had previously been on work experience at the club. That was followed by the news that Mackay had been asked to resign in a letter from Tan, before eventually being dismissed in December. Ole Gunnar Solskjaer took over and wants an instant return to the Premier League next season. And Caulker says he expects to be part of that challenge, adding: "I signed a four-year deal here so I'll be looking to get us back promoted next season." But Caulker, who joined from Tottenham Hotspur in July, 2013, says the players' efforts were the most significant factor in Cardiff's relegation. He said: "We've not been good enough on the pitch." Caulker also denied events off the field had undermined the players, saying: "I think we're strong characters in there. "I think everyone managed to block it out and just focused on what we were doing on the pitch." The defeat at Newcastle left Caulker at a loss to explain the hosts' winning margin. "I thought the boys played well - that was a solid performance. "I'm not quite sure how we lost 3-0, but it's been our performances throughout the season that have ended up in us being relegated. "We've conceded a hell of a lot of goals and we know that if we are going to come back up next year we are going to have to tighten up defensively. "I don't really want to point fingers at anyone. I think we're a team in there, we're all united and we know in the game next week against Chelsea we have to be strong and put in a performance for the fans. "They've been brilliant so I'd like to thank them for their support throughout the season... we hope we can put a performance on for them against Chelsea and give them something to cheer about."